Here you can find a strain description about Granddad's Lavender and also some user-based reviews and infos directly from the SeedFinder (if available). You can also find the offers and auctions here if Granddad's Lavender cannabis seeds are on stock at MyCannapot right now. Granddad’s Lavender is combo of two potent indica dominants, Lavender and GDP (Ken's Granddaddy Purps). High THC levels can be expected, especially if grown indoors with this strain. We took two very purple strains crossed them to make an even more purple beauty. The potent psychoactive effects will hit hard in both mind and body, delivering a mix of cerebral euphoria and physical relaxation. Couch lock is inevitable, and the strong indica high lasts for hours. Like most heavy indica varieties, Granddad’s Lavender is very good medicine for treating chronic pain, stress, insomnia, appetite loss, and muscle spasms. GDL will produce massive yields which are ready for harvest following a 60 day flowering period. 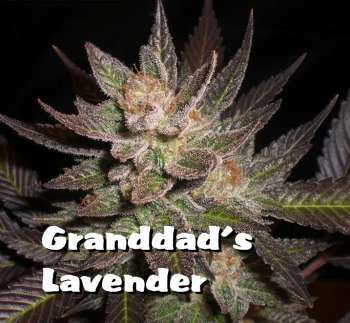 Buy Granddad's Lavender now at MyCannapot!